Killdeer birds are fun to watch. For example, most people love to see how they run because of their stop-start style of running. Their little chicks are cute, like little brown cotton balls on stilts. They behave much like the parents who are devoted to them. In this lens, I will discuss various facets of killdeer life as well as talk about how to deal with killdeer- human problems. 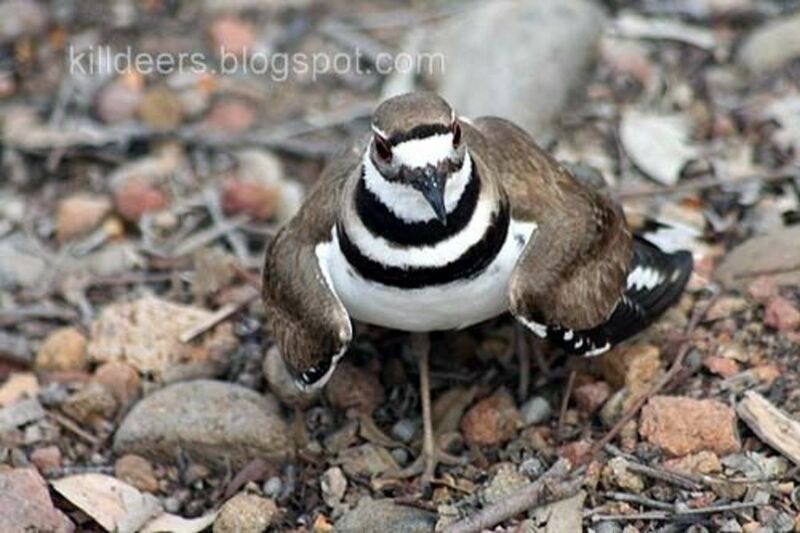 Killdeer are found all over the United States, Canada and Mexico. They can also be found in South America during their summer months. A very small population of them live in Great Britain and are often sought after there by birdwatchers. Some have also been spotted on various islands in the eastern Pacific Ocean. Though they were once hunted to extremes for their bright orange, white and black-striped tail feathers, they are now protected by the Migratory Bird Treaty Act and it is illegal to hunt or possess any part of them, their young, or their eggs. The only exception is for sustenance hunting in Canada and poorer areas of South America in which there are extremely strict controls and requirements to participate in. Most killdeer don't live in areas where sustenance hunting is allowed and those that do are almost never hunted. It has been reported that the taste of killdeer flesh is just barely above edible. **I've noticed there's been a lot of inquiries to this page about keeping them as pets. Please don't. Besides the legal issues, they don't make good pets in any way. While they are often friendly and can appear tame, they do not bond to humans and don't like to be touched. They also tend to be nervous and don't like to be kept in coops or any shelter (they don't seem to like anything over their heads). The only reason to keep any killdeer in captivity is for licensed research, rehabilitation, or preservation. Anything else is going to be trouble for both killdeer and humans. All photos on this lens were taken by me unless otherwise noted. Please do not use them without asking. A killdeer is a medium-sized plover just smaller than a mourning dove. 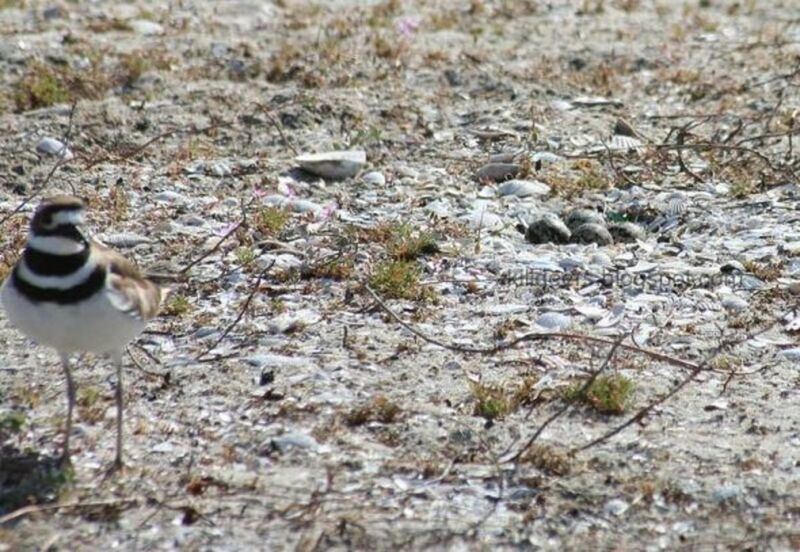 The plover family also contains semipalmated plovers (closely related to the common ringed plover), mountain plovers, black-bellied plovers, American golden plovers, snowy plovers, and piping plovers. 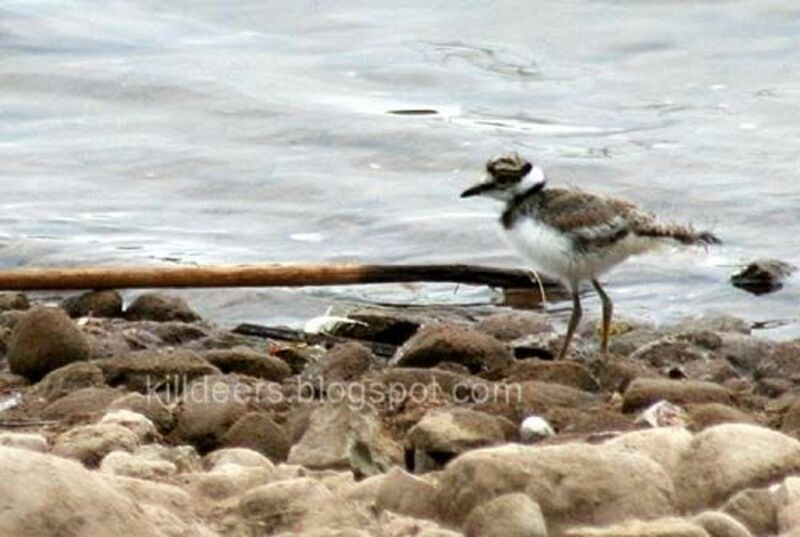 Plovers are also closely related to lapwings and killdeer chicks look very similar to the northern lapwing's chicks. It's name comes from the sound the male makes when announcing it's territory or challenging other males, "kill-dee! kill-dee! ", which also is indicative of it's scientific name: Charadrius vociferus or "talkative plover". Killdeers are technically a shorebird and can be found on the seashore, especially near river outlets where there aren't a lot of people. But, they've adapted very well to living near people away from large bodies of water and can also be found on farms, ranches, near stables, around lakes, in private yards, along drainage ditches, and on roofs. Killdeers live in North America and small parts of South America during the winter. Occasionally, they can be found in Great Britain where it is thought that they may have arrived by storm around the mid-1800s. However, sightings are rare and are often confused with the common ringed plover that is native to the area. Killdeers are social birds and, during non-breeding times, can be found in loose, "unofficial flocks" that are sometimes large in number. Many of these loose flocks consist of family members, sons, daughters, aunts, uncles and cousins. During breeding periods, usually from March to the end of July in most areas, a single male will choose a territory in which he will call for a mate either from the ground or by flying over the air along his territorial boundaries. Any or all females are welcome to visit his territory to inspect his nesting site. Some males make long-term bonds with females that can last an average of three years or more. The pair travel and choose a breeding area together. Male killdeers are almost indistinguishable from the females. In general, males have more black on the face and a more square head. Males tend to be more vocal, overall, but females can also be very vocal when alarmed. I will discuss breeding behavior and chicks in another module. Killdeers eat a wide range of food such as crawling insects like ants, grasshoppers, small crustaceans and worms. They will also eat some weed seeds and insect larva. Killdeer are very beneficial as they eat a lot of crop damaging and livestock infecting insects, like ticks. Killdeers can be seen as a "barometer" to the overuse of pesticides as they feed on a lot of the insects that pesticides are being used against. Organic farmers appreciate the presence of killdeer and other insect eating birds in their fields. Killdeers have many "enemies", especially for the chicks, which are born precocial, meaning "pre-knowing" or very advanced. I will talk about chicks in detail in another module. Domestic and feral cats are probably the biggest threat to the killdeer along with domestic dogs. Other, natural, threats include crows, hawks, foxes, coyotes, weasels, skunks, and other animals that would eat a chick or an egg. 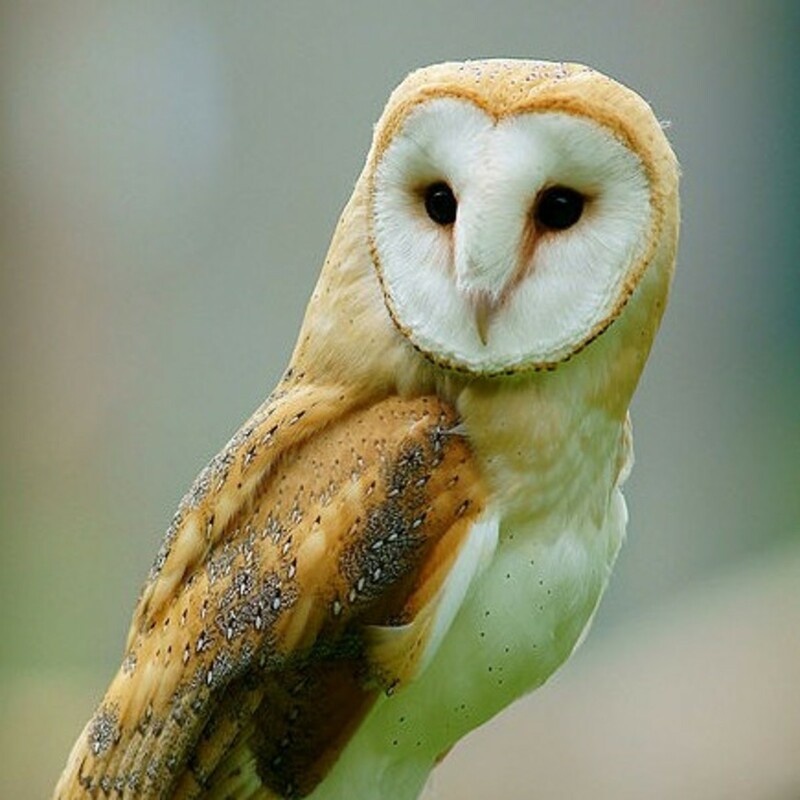 Most threats are to the chicks, who can't fly, but adults can still fall prey to these animals. The average lifespan of a killdeer is about six years. Killdeer populations are stable, at the moment, though there has been a noticeable decline in some areas during the last few decades. This may be due to the increase of development along rivers, lakes, and oceans. Also, human populations may have contributed to this decline with human-destroyed nests, domestic cat (and dog) predation, and increased vehicle traffic. Killdeer are fun to watch, but they are often very shy and generally like to keep a buffer zone of about twenty to thirty feet. They also blend in very well with their surroundings. When protecting a nest or a mate, they may get very close and noisy. Often, they do what is called a "broken wing" act to lure predators away from the nest by faking an injury. Here are some cute killdeer items on Amazon.com. I have one of my own, it's darling! I might get more. If you are getting this for a child, the ones with sound are not machine washable. Currently, this item is out of stock, but hoping it will be available soon! 2014 Nesting Season Is Here! 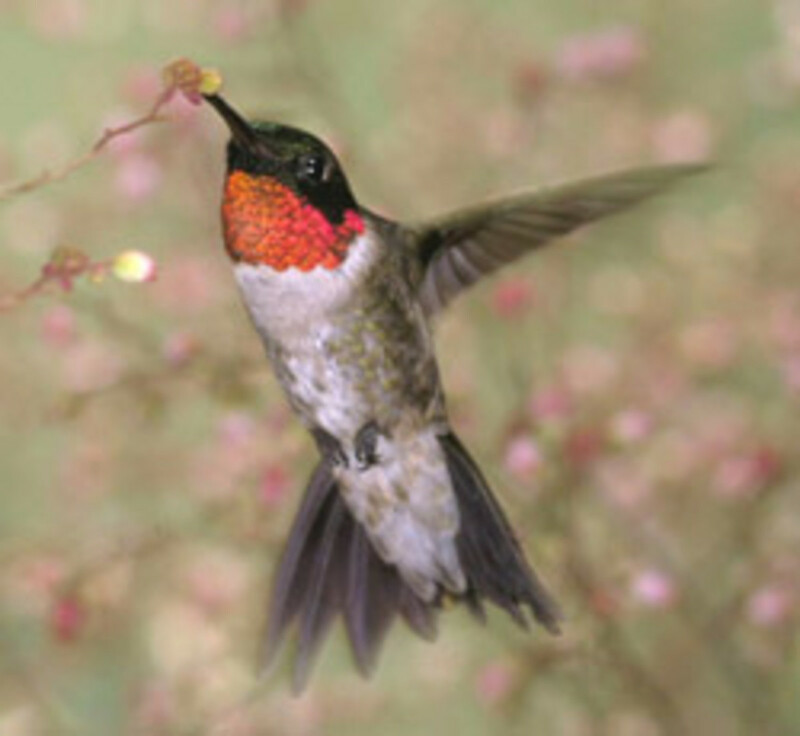 Nests have already been sighted in the San Diego area and I suspect that many other areas will be seeing them, soon. Where I live, they are starting to breed earlier than last year. I've already seen baby herons, osprey and ducklings this year. 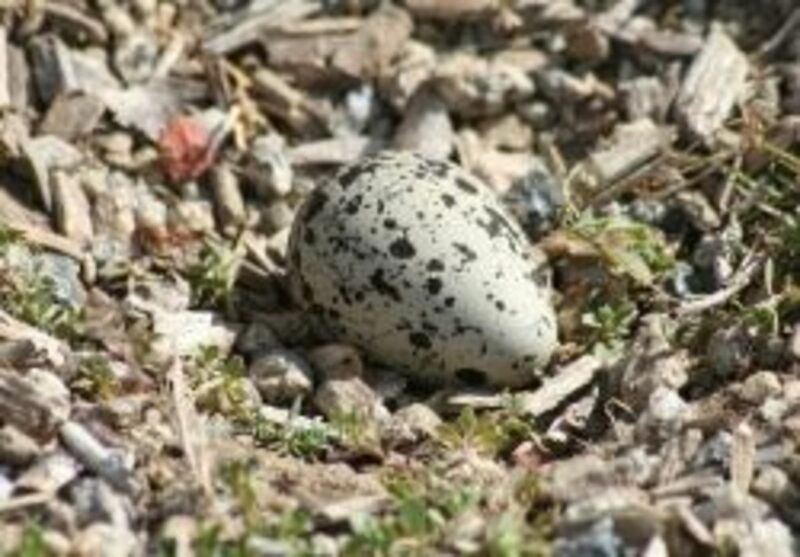 Killdeer nests are difficult to find and are often not discovered until shortly before hatching. Then, they can disappear all of a sudden along with the parents. Usually, if there are no eggshells or signs of a struggle, that means that they hatched and the parents took the chicks elsewhere. If they disappear, but the parents are still hanging around, listen for chicks responding to their deets. If there are no chick sounds, it may mean something happened to the nest. In that case, they will begin nesting again within the next two weeks as long as it's early in the nesting season. Usually, it's best to take a photograph and look for these characteristics on your own time. Boy killdeer chicks have a black or brown stripe that runs from their bill and under their eye. Males also tend to be more curious, adventurous, and take more risks. You are more likely to see male chicks than female chicks out in the open. A photo of a male chick can been seen below. Girl killdeer chicks have a light brown line running from their bill to the corner of their eye only. They tend to be more obedient to their parents and will quickly hide when the parent tells them to. They are also more likely to stay in one place even when they're discovered. After three weeks, however, it gets a little harder to distinguish between the sexes. Generally, the males will be darker over the bill and under the eye. As said before, in most areas, breeding either starts with a single male choosing a territorial area and nesting site or a pair returning/reusing a nest site from before. Single males will then call out in hopes that a single female will come and visit his territory and accept his courtship scrapes and dances. Some pairs stay together for years, but the male must "renew" his bond with his female by doing courtship moves. At the end of each breeding season, the pair may either split up or stay together another year. In the breeding territory, the male will scrape out various nest sites and allows the female to choose one. Then, she will lay an average of three to five eggs, usually over two days, in the scrape and rearrange nearby rocks for good heat transfer and camouflage. Both she and the male will begin incubating the eggs after the last one is laid. The eggs, in general, take from 24 to 28 days to hatch. If the weather is on the cool side, the eggs tend to take a the longer number of days. If cold weather hits during a critical period, the chicks may die before hatching. 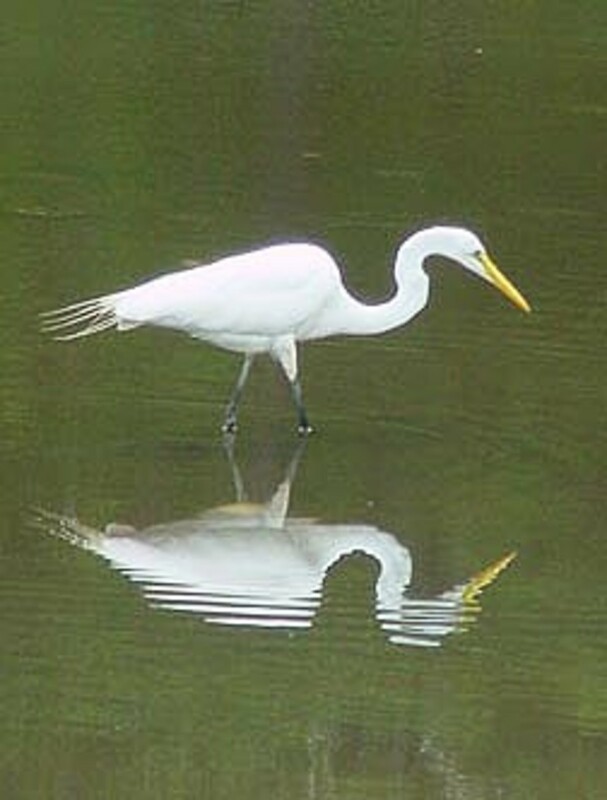 During the hatch, the parent removes all eggshell, either by eating it or moving it far away. Some researches have noted the opposite in their studies, however. But, most people who have observed killdeer nests in their yards usually report that the shells are gone by the time the chicks are moving about. Killdeer chicks can be up and running as soon as they're dry, but tend to stay near the nest for the first few days, if the parents feel it's safe. However, if either parent feels that the area is not safe, they will leave as soon as possible and never come back. Killdeer nests are notorious for disappearing in what would seem a blink of an eye. Sometimes, there will be one egg that will be late in hatching and parents often wait a long time to try to hatch it. If the parents are extremely anxious about leaving, they will sometimes throw that last egg off the nest, possibly to detract from predators following the rest of the family to safety. Unfortunately, that late egg will sometimes hatch and die soon afterward. The parent does not feed the chick, but rather leads the chick down to a feeding area and shows it what is good to eat. The chicks copy their parents and feed themselves on the smaller bugs, worms, and crustaceans. During the first week, killdeer chicks rely on camouflage and hiding rather than running. They will stay very still like a rock and can even be handled when they do so. Sometimes, the parent will shield the chicks under their wing, especially when there is possible danger from above. After about a week, the chicks usually are adept at running very fast and will rely on that mode of defense until they fledge (begin flying) at 30-35 days of age. Here is a mother killdeer rushing up to me to distract me from her nest. Here are some fun killdeer facts, some of which have already been mentioned in this lens. Killdeer chicks often survive falls up to 30 ft, especially if the ground below is "soft"
Here are some links for more "official" information about killdeer. I will be posting more links as I find them. Click here for some common killdeer sounds. 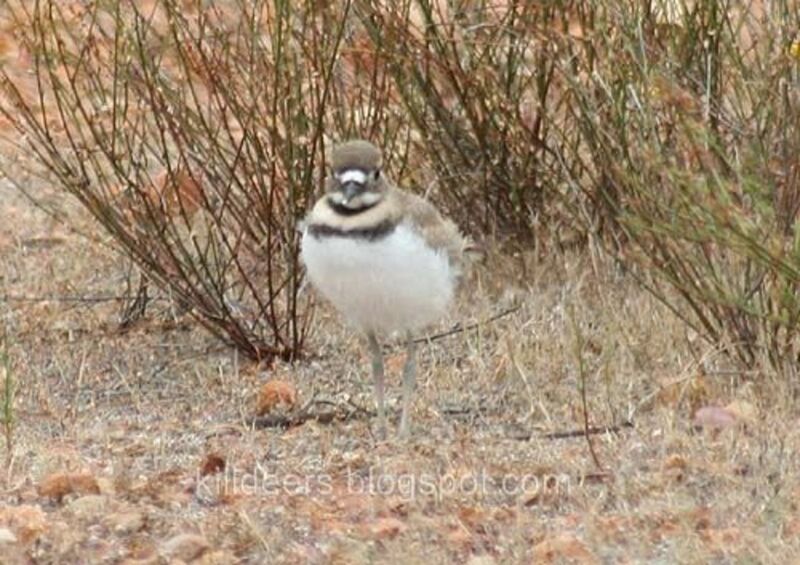 Killdeer are precocial birds: the young are hatch fluffy and ready to run. By their behavior, parents tell you chicks are nearby. Killdeer nest on the ground. The eggs look so vulnerable, it's tempting to interfere, but it's better for the killdeer if we can simply let nature be. Here are some fun killdeer videos to watch. 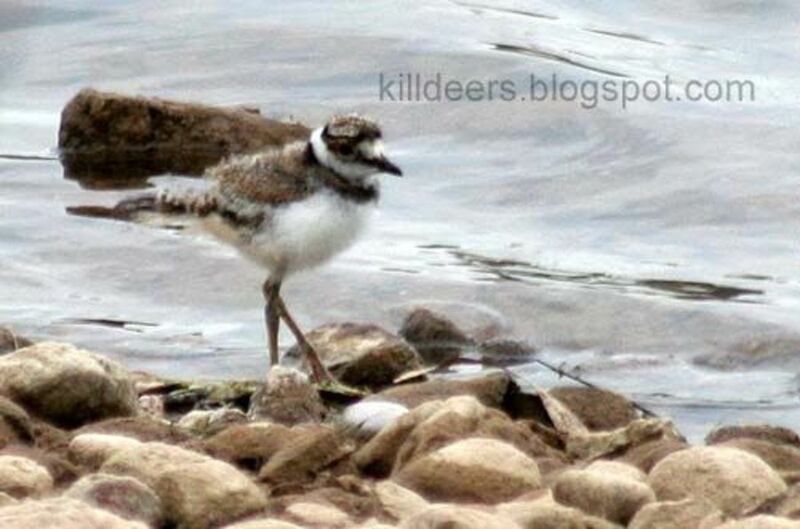 Here are some slideshows that I made from my photographs of killdeer chicks. Smudge, a month old killdeer chick. Smudge at a younger age. Castor and Pollux (Pollux is the father of Smudge). Create an environment that killdeer like. 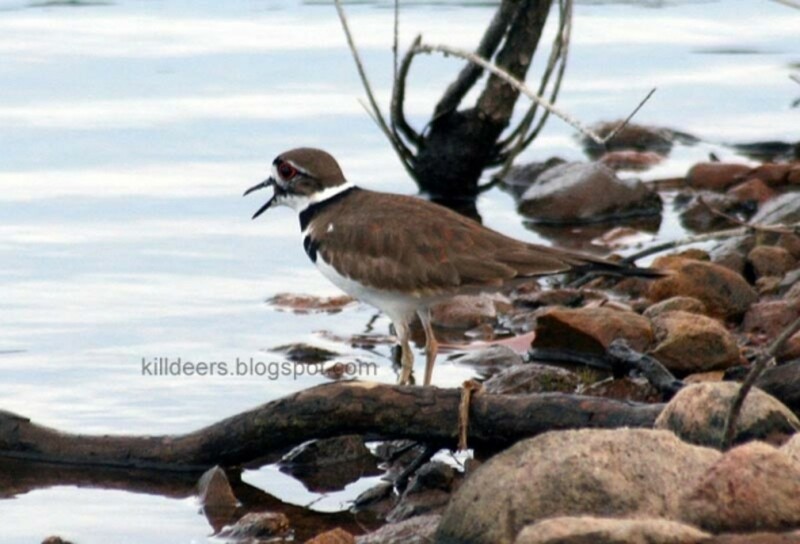 Killdeer like to be close to a freshwater source. They don't have to have a shoreline or live near a lake or river, but they need daily water both for drinking and for their food. 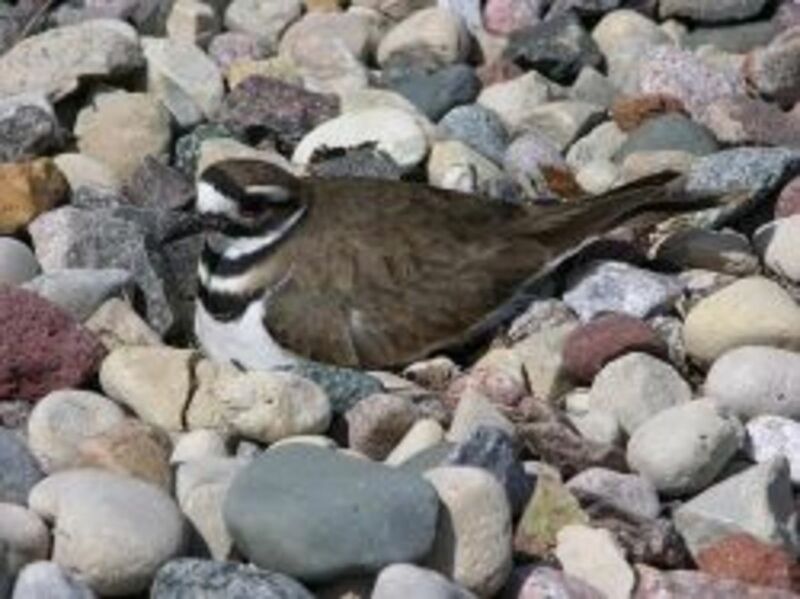 Also, killdeer like to have wide open spaces with lots of gravel or buff-colored rocks to lay their eggs in. They don't like anything blocking their view of any predators above or on the ground and they want their eggs to blend in. They also like places with lots of insects such as ants, worms, and insect larva. Keep possible predators to a minimum. This includes domestic cats and dogs. Fencing that keeps out stray pets and larger predators, but have enough spaces or holes in it to let out killdeer chicks would also help. Using predator urine (make sure it's not a predator in your area) and other smells that these animals find displeasing may be helpful. Some people in more rural area use chicken wire with large holes topped with a string or two of barbed wire to keep predators out of their property or pets away from certain areas. This may require burying some of the fence as many predators like to dig. Not only will this help keep out killdeer predators, but help to keep other animals and livestock safe. One of the biggest thing you can do is discourage crows, large blackbirds and grackles from regularly visiting or nesting in the area . Grackles have been observed killing adult killdeer (though rarely), crows often follow and "bully" killdeer, but all three of these birds will kill and eat killdeer eggs and young. If at all possible, do not keep or spread any feed containing corn or peanuts anywhere close to the killdeer nesting areas. Also, these birds like pet food and will eat trash that is not covered. If you must feed livestock with corn-based feed, try to do so in an enclosed area where the crows, blackbirds or grackles can't get to it or put in a container and feed with supervision while chasing the pest birds away. Remove all leftover food as soon as the animals are done eating. Don't make a regular habit of feeding mealworms or other worms to birds as grackles often take the food right out of the other bird's mouth or will attack them. 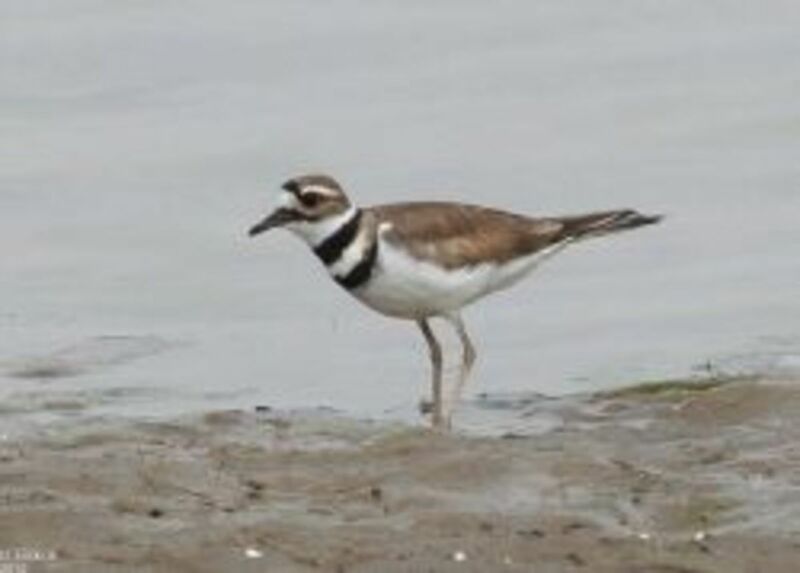 Be careful if you are planning to use any kind of eradication techniques on these birds as many of them eat the same food and use the same environment that the killdeer uses. Suggestions for common killdeer questions and problems. 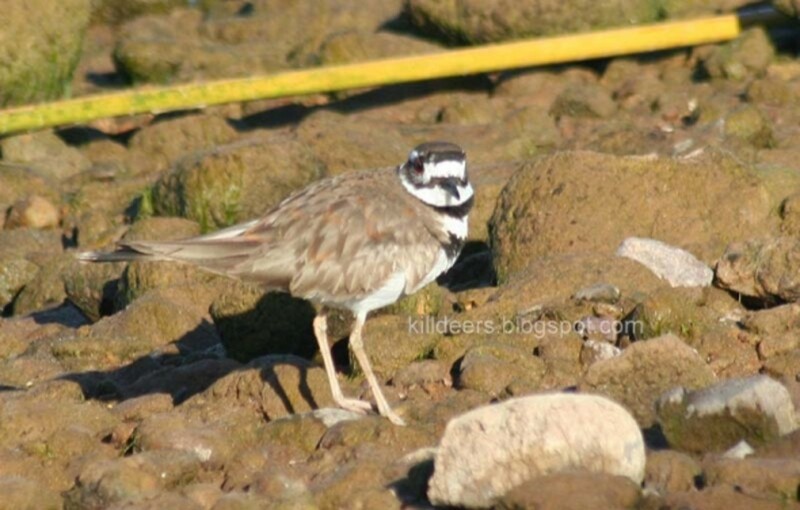 I thought I would answer some of the common issues that I have seen come up when people talk about killdeer. Some of my answers are based on my own experiences and observations, some are based on advice given out by wildlife rescue agencies and biologists. I found a baby killdeer all alone, what should I do? 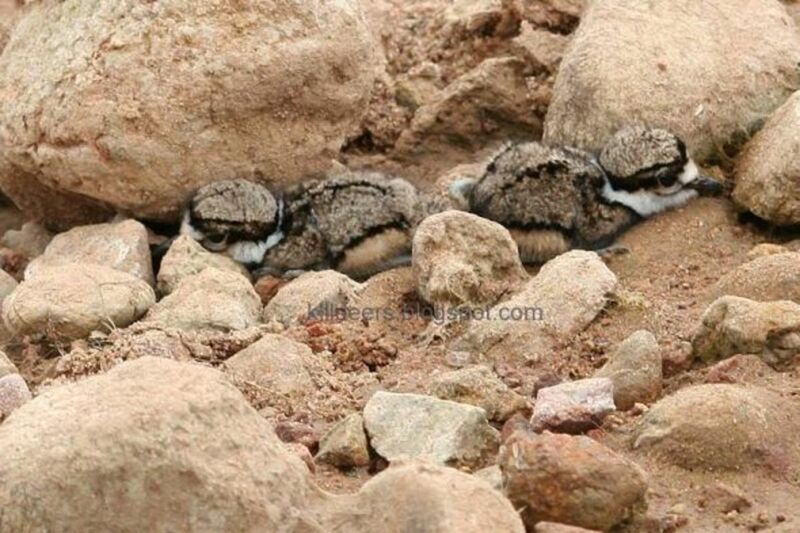 It's not uncommon for baby killdeer to be all alone, especially when they are 10 days old or more. The parents often leave their babies alone while they feed or defend the area. The best thing to do is leave it alone and watch it from inside a car or building or far away with binoculars. Chances are the parents are nearby and are waiting for you to leave. You may even hear the parents calling. If the chick is in immediate danger or you know for sure the parents are dead, then take the chick to a rehabilitator. If you think that the danger can be eliminated or pass within a day (such as in the case of a pet threatening the chick), keep it in a cardboard box with some paper towel, a heating pad set on low, water and a lamp (make sure that there is shade and a "cool area" in case it wants to cool down). Then, as soon as possible, return it back to the area where it was found after the danger is secured (watch for crows and other predators as they are very smart and will watch what you're doing) It is illegal for you to possess these birds or eggs. Chicks often die under human care if they are not treated delicately by people trained to help them. Touching a baby killdeer will not cause a parent to reject it. If the real parents are not around, try finding another family with chicks near the same age. Make sure the parents act interested in the chick before letting it go and then move far away, preferably out of sight, and observe. Eventually, the chick should be following the other adults or be brooded by one of them, though it might not happen right away. If not, or if the chick is attacked, collect it and take it to the nearest wildlife rehabilitator. I found a nest that with two eggs smashed and took the other two home, what should I do? This answer can be applied to most "I found an egg" question. Most wildlife officials and rescuers will tell you to put the eggs back unless the destruction was caused by humans, their pets or vehicle traffic. A lot of animals eat killdeer eggs and, sadly, this is a part of nature. If the eggs aren't in immediate danger, call a rescue agency and check before removing them. Don't try to hatch them yourself as the chicks often die upon hatching by a human. A rescue agency has incubators and other means to prevent that. I was really enjoying some cute killdeer chicks running around my property after hatching yesterday. Last night, a neighbor's cats came and killed two of them; the other two and one parent are missing and I think the cats got them, too. What happened and how can I prevent this next time? This is truly a sad situation as it looks like your neighbor's cat got them on the nest by surprise. They may not have known there were cats around until then. But, cheer up, the other two may be safe with the other parent. One parent may stay behind at the nest site to "make sure" that the other chicks are really gone before he/she abandons the nest. When you have cooled down, talk to your neighbors about the cats and see if they can confine them to their property. Or, you can buy "cat deterrents" such as cat-proof fencing, sonic devices, or predator urine (make sure it's not a predator that frequents your area) to keep cats from entering your property. Other suggestions can be using mulch that smells bad to the cat like something with orange peels or cocoa. You may have to reapply these often. I once heard a suggestion about planting catnip near where the cats enter the property. The cats smell the catnip and forget why they came over there in the first place and go back home. No solution is 100% cat-proof, but anything you can do will lessen the probability of an attack. Check birding sites for more ideas. What, as a cat owner, can I do to help ground nesting birds? The single most effective thing you can do is keep cats confined indoors or in an outdoor enclosure or building. However, this may not be possible, especially in rural areas where cats are often kept for rodent control. In that case, the best thing to do is spay and neuter your cat. Studies have shown that spayed female cats will stay close to the areas where they are sent to "work" and not wander. Neutered males wander a little more, but not as much as un-neutered males. Cats can also be "de-conditioned" to hunting birds or other animals through training (yes, cats can be trained and conditioned just like any other animal) Another thing is not to leave out food for strays and work with feral cat agencies to spay and neuter feral cats. I love killdeer and want to encourage them to nest on my property, what should I do? Killdeer love open spaces with lots of gravel. They also like to have a freshwater source nearby (sometimes a pool or drainage ditch will suffice) and lots of bugs. They need to have an area in which they feel safe with no threats of cats, dogs, or other predators. Make sure your neighbor's pets don't wander on your property and tell their owners what you are doing so that they won't be surprised or annoyed by the noise (if you are in a more populated area). A killdeer nested right in my driveway! I'm afraid the nest will be run over, what can I do? Can I move the nest? Killdeer love gravel driveways and often nest right in the middle of them. Unfortunately, they don't consider vehicles very threatening and driving up and down the lane will not discourage them from nesting there. If at all possible, put up cones or a barrier so that no one hits the nest on the drive in. Try to go around the nest as much as possible. Do not try to move the nest. Moving the nest is possible if done correctly, but it's very tricky and should only be done by someone who is knowledgeable about these things and has a license to handle wildlife. If it is done wrong, the bird will abandon the nest. It should only be done as an absolute last resort if all other options fail and not because it's inconvenient. I have a killdeer nest on the roof and I know that the parents don't feed the babies, but lead them to food. I'm afraid that they will starve or get hurt if they try to jump off. What should I do? Fortunately, roof nesting killdeer are rare compared to the many thousands of other nests around. They tend to nest on flat, gravel roofs, or roofs made to look natural. If the roof has a parapet on all sides then the chicks will probably starve, so they will have to be rescued. If possible, check the roof often and as soon as the chicks have fully hatched, gather them and take them to the ground below. Make sure you do this under the parents' supervision so that they can easily find them. Set them on the ground and then move far away or inside the building. If you don't have a parapet problem, can't access the roof easily and your building is lower than 30 feet, make sure all areas around the building have a soft landing material such as grass or soft mulch on "jump day". Many chicks survive jumps from lower elevations as long as they don't land on hard surfaces. Be prepared for some possible causalities, though, because killdeer chicks are not designed to jump off of buildings. But, I DON'T want killdeer hanging around! What do I do? It's hard to keep killdeer out of your area if they decide that it's a great place to live. But, here a few helpful insights that may help discourage them. First, I would like to say that it is illegal to intentionally harass them, so having your dog (or child) purposely run after them is not good. However, having a dog or child frequently use the yard may make the yard less attractive to killdeer. Cats are not a good idea as not only will they kill the birds, they are often not a good deterrent. Since killdeer like wide open spaces, taking away those spaces may help reduce the likelihood that they will choose your yard. Occasionally flying a kite that looks like a falcon or bird of prey (with it dipping and diving) may be of temporary help (playing falcon calls at the same time may increase the chance of success). Moving around a fake owl or hawk or having those big googly eyes might work in some occasions, but it is not guaranteed. They don't like strange sounds and noises and may freak out at them, at first, but quickly adapt. Why are killdeer so noisy at night? Don't they sleep? Killdeer don't sleep in long stretches like many mammals do. Mostly, they take short naps throughout the day and night. Naps at night usually last longer than naps during the day and killdeer are, overall, less active at night. They don't roost in trees like perching birds do, but right out in the open. With artificial lighting, killdeer have been known to be more active at night than they would in areas where there is no or only natural light. Photo provided by a personal friend of mine. Follow the life of a real killdeer family! Follow the life of a real killdeer family under the patriarch named George. 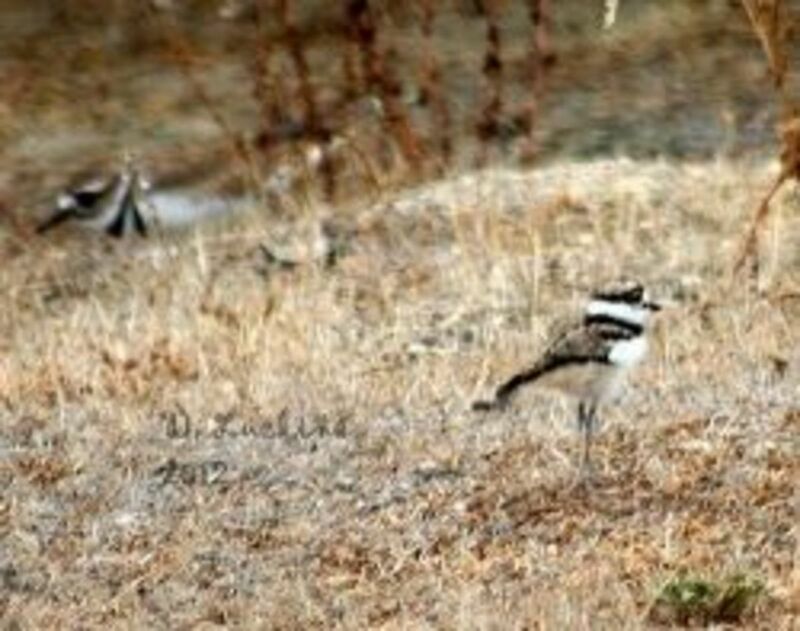 George is a middle-aged killdeer living at Lake Murray in San Diego, California. 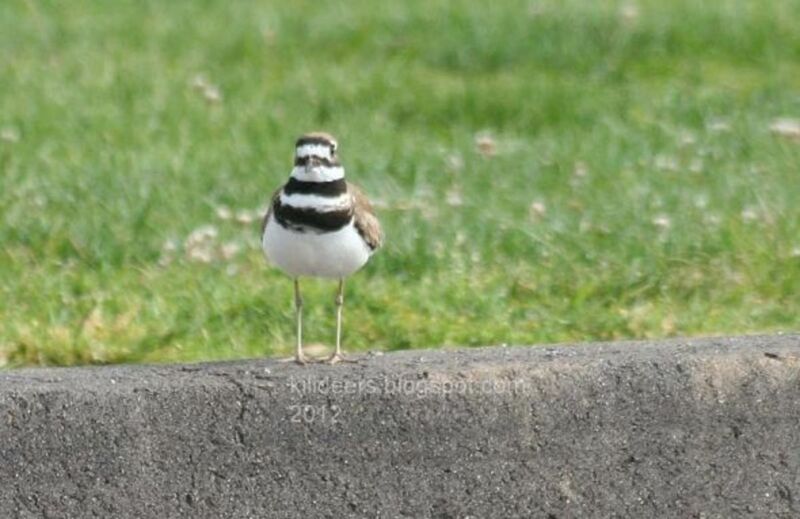 Learn about his life and the life of a killdeer family through this Squidoo lens. If you like this lens and you like killdeers, please leave a comment. The Little Mourning Dove, A Common Sight in the U.S. Thanks! Sorry I couldn't respond earlier. If it was over six weeks, then they probably weren't going to hatch. High temperatures can be bad for egg development and that was probably the most likely reason. If it's been hot for that long, then they probably didn't develop very far. We have a nest with three eggs in it - both parents have been taking turns in the nest - I've read it takes 24-28 days to hatch - but it's been well over 6 weeks and no activity. We've also had temperatures over 100 for a good share of that time . Could that be dangerous to the chicks inside the eggs? Thanks! Love the blog! I am a professional Outdoor Guide-mostly climbing-and enjoy your lenses very much. Thank you for taking the time to create them! Great lens! Packed full of useful information. I love these little guys, especially the chicks. I love to watch Killdeer. Black-necked Stilts and Killdeer are the most common shorebirds in the desert, and I always see them near water. Sometimes the only way I know Killdeer are present is to hear them calling. Sometimes that helps me locate them for a good look. This is a comprehensive and informative lens. Thank you. Very well written article with captivating photos! It's clear that you really understand this bird specie. 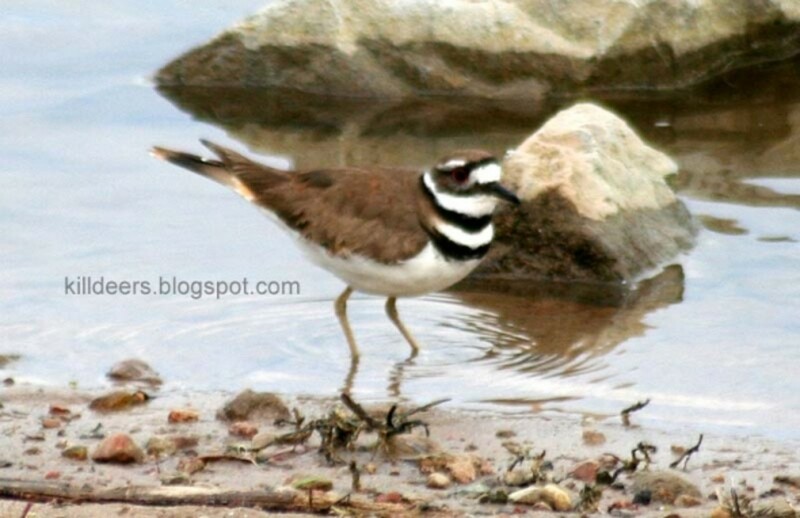 I love killdeer and they have appeared in many of my poems. We used to observe them often when we lived in Quebec and Vermont. Nice lens! I'm very impressed by this article and your photos. I really enjoyed watching the videos - they tell me that I need to take more videos. Thank you for publishing this lens. It's wonderful. We've happily enjoyed one adult killdeer with one chick in our driveway since July 15th. The chick was still running underneath it's parent on that day. I spotted it because the house sparrows were after it and the parent was making a stir. Of course I discouraged the sparrows and the killdeer have been here since then. Today the chick is peeping with no parent. Do the parent birds leave the young for periods of time? Is it possible for the chick to survive alone at this point? I have not seen it fly yet? Thanks for any answer! @anonymous: It's possible that the baby is either flying already or almost ready to. The parent might be nearby, but not visible. Usually, they don't leave their chicks alone for that long if they're not flying, yet. If it is peeping, then it's not happy and could be looking for its parents. If no predators get it, it can still survive on its own until it's able to fly which should happen in the next few days to a week. I hope everything goes OK for him. Great site and chat! One adult killdeer with one chick have spent the summere between my driveway/yard and the driveway/yard directly across the street. The adult was very busy with this chick due to the activity on the road and in our drivways and yards. We have a dog and our neighbor has an outdoor cat! We first observed the pair on July 15th. The chick was quite small and was still brooding underneath the adult at time. The house sparrows were after the baby and the parent did a great job discouraging them. It's been 30 days and today is the first day the adult is not with the baby. I have not seen the adult all day. Do they leave the chick for periods of time or has something happened to the adult? I assume the baby is almost ready to fly and might live to fly if it's careful? I was lucky enough to see a killdeer at dusk when I was riding my bike through a nearby school parking lot. I was surprised to see a killdeer, but more surprised that the sweet little goofball was using the crosswalk area! It literally crossed the road in a straight line within the paint boundaries. When I biked back in a couple of minutes, I could see its well-camouflaged baby. As I watched from a distance, the parent convinced baby to also cross - in the crosswalk - until it was close enough to do that adorable baby killdeer hiding-under-parent. Found this when I came home and did a bit of research since I was initially concerned that a shorebird wasn't near a shoreline, but after reading up I see that's pretty normal. 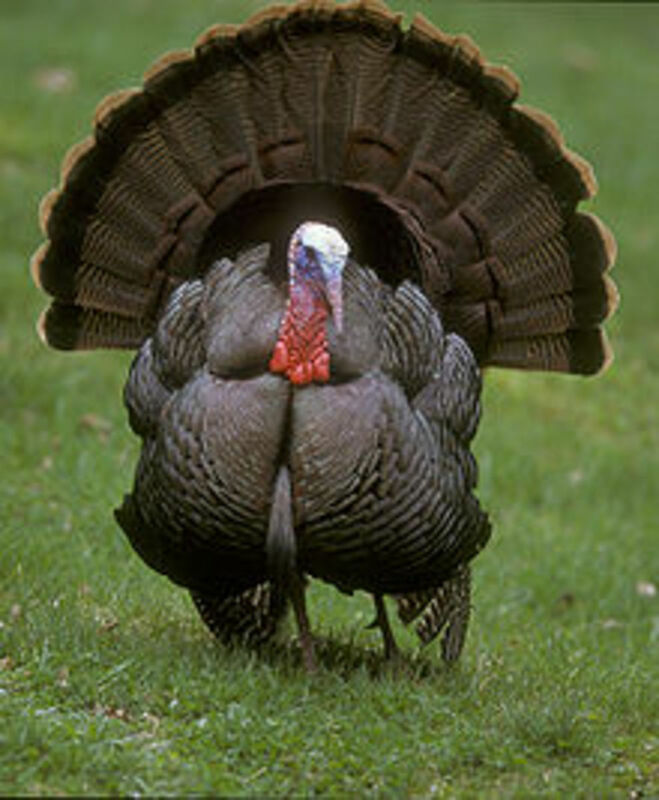 Thanks for the lovely site about a nifty bird! I enjoy reading your lens! Well done! @anonymous: It might be a new pair or mama picked a new mate and started a new brood. Either that or she began to ovulate again and has produced another brood with the same mate. I had one female do that, before, resulting in having a young chick which she raised herself with an older sibling while her mate cared for the other two practically alone. Or, something happened to the other chicks. Since the male has not been seen, I would think that the other chicks are with him. It will be much harder hatching and raising chicks with a single parent. Usually, only one or two chicks will survive when that happens. We have three pairs (all from the same family) that share roughly the same nesting area where I live. I live in southern California and it's very unusual for for killdeer to begin a new nest after the beginning of June. I did have one breed in September, but that was only because she had a hard time finding a mate. They don't really migrate around here. @Shorebirdie: Well, Mama killdeer surprised us today with 3 eggs - in the SAME nest as the first batch! We've not seen papa and chicks since Saturday evening. Since we are in Idaho, I don't think it is considered late in the season; for in the last 2 years we've had killdeer produce 2 broods, but much farther apart - the second usually appearing in late June/early July. What is so surprising is that it's been only about 2 1/2 weeks since the first brood hatched! We're pretty sure it's the same pair, but could another pair take over an old nest?? This has been an amazingly interesting spring season for us! Thanks for your insights. @anonymous: It would be unusual for them to start a new nest this late in the season, but it has happened. They rarely use the exact same spot, though. Killdeer do like to do "false brooding" as a distraction display to lure your attention away from their chicks, though. Most parents will look after their chicks until they are at least six weeks old, so if the chicks are still around and are young, she may have been trying to distract you. Our resident killdeer couple successfully hatched all 4 of their eggs, and they've been a joy to watch. Today, we noticed mama on the original nest. It looks like she is brooding, but no eggs yet. Will there be a second batch this soon?? We are in the intermountain west. @anonymous: Yes, both mom and dad do that. I have killdeer outside my classroom in the little courtyard...do you know that the mother calls them and then envelopes them under her wings like an umbrella for protection ! Mama looked like she had SIX legs ! From a bird lover, I am flying in to bless this lens! @conni-holte: I think the last egg was abandoned. I saw mom and pop bird out by the nest about 5:30 last night and haven't seen them since. @conni-holte: That's too bad. Usually, once a predator attacks the nest, especially if more than one egg is damaged or missing, they will abandoned the whole nest. @conni-holte: the first two eggs were laid on 5-10....... they disappeared one at a time over several days.... she (he?) is still sitting on the one egg though....We have coyotes too, but if the kitties are smart and stay around the houses, they don't fall prey to them. i believe this kitty has a home, he's just an outdoor kitty. All my kitties live inside. @conni-holte: Sometimes three will hatch around the same time, leaving one left over. Often, parents will abandon that one egg, especially if there's predators around. Or, they may try to hatch that one even after the other chicks are up and running around (and hiding). Did the three disappear all at once, or did they disappear one at a time over several days? We have coyotes were I live that keep the stray cat population (as well as other small and medium-sized carnivores) down to a minimum. sigh......we started out with 4 eggs......now we have one........we live in the country and the outdoor cat population has grown. I believe the culprit is a black and white kitty. @anonymous: If you found them the first day that they were laid, then I would say that they take anywhere from 24-28 days to hatch. However, most people don't find the nests until they are closer to hatching time. I've found several nests a day or two before they hatched even though I knew where they laid eggs and was looking for them. So, if they suddenly disappear sooner than 24 days, they probably hatched and were further along when you found them. They will probably move the chicks away when they hatch. @trendydad: Thanks for visiting Trendydad! Actually, they are not endangered, but are protected and are declining in population, slightly. However, we must not take them for granted. 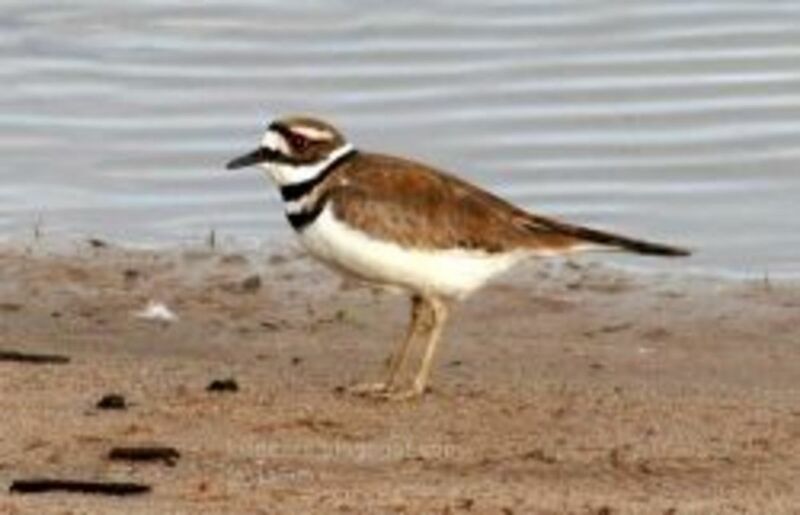 There were birds even more common then killdeer in the past that became nearly extinct within a single human generation. I grew up loving these birds. My brother and I were fascinated by them as we played outdoors. What beautiful creatures! @Shorebirdie: Thank you Darlene for the reply. No one was at the nest @ 5:30 this morning, but 1/2 an hour later both parents were there, one on the nest and the other poking around for food. Maybe their parenting style isn't so great and I need to call Egg Protective Services. ;-) The fencing, which is the cheap garden border fencing, so it's pretty open, is, I'm guessing, about a 12 X 12 square around the nest. My hubs might have gotten a little overzealous with his protection measures. LOL I will open that up for them so they'll feel better. thank you again for the reply and advice. @anonymous: Hi Conni! Sometimes, if they're early in the nesting process, they may leave for several hours depending on their parenting style. But, usually after they're done laying all the eggs, there will almost always be at least one parent in sight of the nest at all times. How open is the fencing and how far from the nest is it? It's possible they weren't comfortable with it if it was too close to the nest or looked like it surrounded the nesting area. I know people put cones and flags near nests with no problem. Killdeer are very devoted parents and aren't easily thwarted from nesting, so it must have been something really upsetting if they abandoned the nest for good. Perhaps they saw a predator like a hawk nesting nearby. Hi. I have a nest in my driveway with two eggs laid yesterday. We have put some open fencing around the nest and can see it from our house. My husband hasn't noticed a parent bird around since early this afternoon and I haven't seen one this evening. We have several outdoor cats in the area, though we never see them in our 'yard' (we have 3 acres). I am wondering if the parents leave the nest for long periods of time. It has been about 3 years since we've had a driveway nest and it seems like I went through this same worry then too. Thank you. I am fascinated by the many varieties of birds. What fun! Also, thanks for liking my lens: Books from the Heartland. 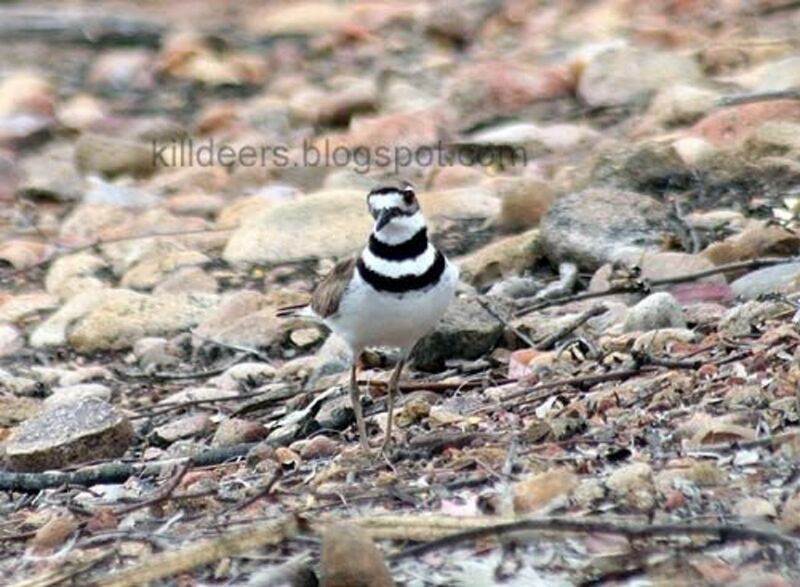 one of my hobbies is bird watching and i thank you for this info because i have never seen any killdeer in reality. when i see one then i know its name. I grew up on a ranch with a lake just below the house and killdeers were a daily sight and sound. I still love to hear them. @anonymous: You're right, it's very tempting to touch baby birds and eggs when you see them. I have touched baby killdeer, but only when absolutely necessary. I really like those killdeer chick videos. You must be the "Killdeer Whisperer"! I grew up in the country and have see a few Killdeer and remember Day first showing us a nest when we were young, we kept our distance and didn't touch them but it was sure tempting. The video is so sweet and you just brought sweetness into my day here. I've always enjoyed watching the Killdeer with there cute little run and stop ways. @ElizabethJeanAl: Yep, they should be back everywhere now except in northern Canada and Alaska, though many do stay in some areas all year around. Spring is here. The killdeer along with most of the songbirds are back! This is outstanding info on Killdeers. Thank you for publishing this lens. I came back to bless this lens. I don't know much about birds at all, but I enjoyed your lens because not only was it very informative, it conveyed your love of these birds very well. Thanks for sharing this. One of my favorite birds to watch. Thanks for this fabulous lens! I love the killdeer. They are fun to watch. Enjoyed this visit. I love shorebirds. Have not had many encounters with killdeers. It was gratifying to watch the mother care for her chicks and fun to learn that they hiccup when feeling a potential predator threat. Thanks for all that you shared here. It was great to learn more about killdeers. that we have never met before, so I thought I would add this here as I have picked your lens. 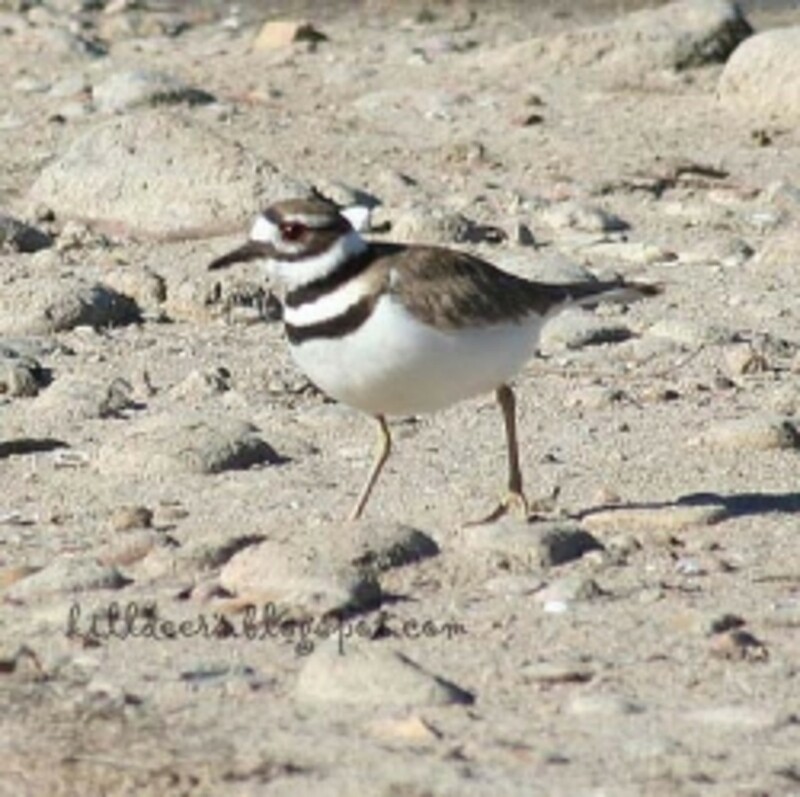 I loved reading about the killdeer's, when I first seen the title I thought it was about an animal, but surprise it was a bird, and a very interesting bird as I have found out by reading your lens.Thanks for sharing with us. Blessed. I enjoyed reading about the killdeer. Last year I heard a killdeer and spotted it doing the broken-wing behavior. Knowing that it was trying to lure me away from the nest, I looked around until I spotted it. Wow, was it perfectly camoflaged to blend in with the gravel. I left them alone, but checked back in a few days, hoping to see chicks. Unfortunately something had broken the eggs. Such a personable and intelligent little bird. I always marveled at it's interesting name. @Andy-Po: Yes, they are rare and people are usually excited to see them. I can't remember, exactly, where you can see them the most. Great lens. Very interesting. I didn't realise that they live here in Great Britain too. Mostly we see Lapwings here, which I think is a kind of crested plover, or at least closely related to plovers. Great info and beautiful photos. Thank you for making this lens. Lots of great information. I've always loved these little birds. @marsha32: Awww, that's really sweet of you. I really need to get back here on Squidoo and do some more stuff, especially since Gather is not that busy. @WildFacesGallery: LOL. Hopefully the dogs don't ever discover the chicks. Wow loads of killdeer information here. Nicely done! We have them everywhere this time of year. I walk a couple of miles everyday with my dog. In the early Spring she always chases the adults as they lead her away from their nests (not that she was heading for their nest anyway. They just think she is) Within a few days though she figures it out and stops chasing no matter how close they get to her. Until next Spring that is. @ElizabethJeanAl: Yes, you are right, they have adapted well to all kinds of environments. It must be fun to see the little chicks running all over every spring/summer. The killdeer are considered shorebirds, but they can be seen throughout the country. Many nest in the fields around my parent's farm.